An ancient legend says a great pirate treasure is buried on the island of Martinique. Pirates would have attacked various merchant vessels, confiscated their loads and eventually sunk the ships. Afterwards they would have brought the stolen jewels, objects and coins to the island to bury the treasure over there. Many have tried to find the Lost Treasure, but nobody has succeeded so far. You are the captain of a pirate ship heading for Martinique. After dropping anchor in the morning, you set off in a rowboat towards the island with four of your most loyal pirates to find the Lost Treasure. 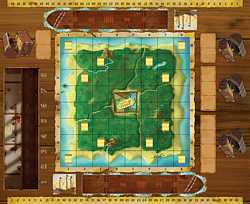 Will you unravel the legend and add your name to the illustrious list of great pirates and rulers of the seven seas?